After sharing with you my favourite books in translation, my favourite untranslated books, and the best of both translated and English-language crime fiction, including my Top 5 on Crime Fiction Lover, what is left? Well, all the other favourites, of course, which don’t fit into any of these categories. They fall mainly into the fiction category, with a couple of non-fiction mixed into it. (I will discuss the poetry separately, as I tend not to list the poetry books on Goodreads). Now, what do you notice about this list? That’s right: it’s all women writers. I believe I’ve read roughly equal amounts of male and female authors, but it’s the women who have really appealed to me in this year of finally living on my own. Hard to categorise, I see this as a book of ideas, where essay and stories blend, where the narrator becomes a camera recording other people’s thoughts and reactions. A very Anglo-Saxon way of dealing with grief and separation, slightly detached, masking the heartbreak with cold detachment. In many ways, the mirror image of Outline, but with more abandon. Once again, Greece is the backdrop, almost an excuse for a story about break-up and grief and self-recrimination – to a much more self-excoriating extent than with Cusk. A clear story arc, but also a novel of ideas, of reflection, but inwardly rather than outwardly focused. Perhaps it’s not surprising that stories about separations loomed large in my reading this year, but this true crime account of a man who was suspected of killing his children took me to places where I barely dare to tread. Garner has a talent for unpicking not only the personal tragedy but also the judicial system and the way in which a jury’s mind can be made up. The farming heritage in me thrilled at this story of hard graft and taciturn farmer families. Writers’ retreats and big egos are an endless source of satire. Delightful escapism, with a real love of beautiful location and a sharp eye for human foibles. Just as charming, warm-hearted but keeping the eyes wide open and critical. Quite simply one of the most quietly menacing, tightly written and brooding books ever! Perhaps it didn’t quite live up to my expectations, but I still found it a beautiful read about an uncomfortable marriage and a bid for freedom. Non-fiction of the highest intellectual and poetic order. Eco-thriller with rich prose and unusual characters which deserves to be better known (full review coming soon). It looks like I will be reading quite a bit of translated fiction in 2018 – 12 titles are guaranteed, since I joined the Asymptote Book Club. I can’t wait to start getting involved in the discussions and all the special features (interviews with translators and authors, book selections, reviews, pictures and so on). Don’t forget you can join anytime during the year, for either 3 months or 12 months. I also want to take part in the by now classic reading events such as January in Japan, Women in Translation Month and German Literature Month, although I make no promise about how many titles I can cover: at least one, hopefully more. Of course, I will continue reading and reviewing crime fiction: it’s a habit I cannot kick (nor do I want to). Finally, I want to read and review more poetry and take part more frequently in the dVerse Poets Pub or other prompts, both to limber up my writing muscles and also to see what others are writing – always inspiring! Speaking of dVerse Poets, I am delighted to announce the arrival of an anthology of poetry from over 100 dVerse contributors all over the world. 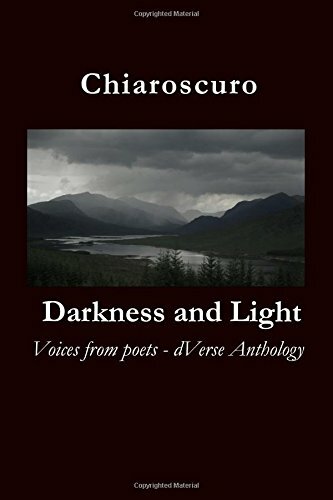 Entitled Chiaroscuro: Darkness and Light, this surprisingly chunky volume is a testament to our friendship across borders and shared love for the well-chosen word. The reading mojo is on its way back this month, although it has been quite heavily loaded on the crime fiction side of things. Out of the 15 books I read this month, 10 were by women writers and 12 were crime-related. That is the sort of comfort reading I crave, although I have also ventured into self-help, true crime and historical fiction. Katie Kitamura: A Separation – even this has a mystery at its heart, although of course it is about much more than death. When the narrator’s husband goes missing in Greece, she does not have the heart to admit to her in-laws that they have been separated for six months, so she travels there to find him… and in the process finds herself. A full review to come on Shiny New Books. Rachel Cusk: Transit – Kitamura’s book reminded me very much of Cusk’s Outline, so I moved on to the second in the trilogy. This is also a series of vignettes about the people the narrator encounters as she sets to buy and renovate a property in London. A more subtle, less self-centred book than Kitamura’s. Marie Darrieussecq: Men – read this one for France in the #EU27Project, about a French actress’s ill-fated passion for a black actor/film director as they prepare to film in the Congo. Harriet Lerner: Why Won’t You Apologize? – Psychologist Lerner examines why it’s so hard to offer a heartfelt apology and how to repair relationships and restore trust. Witty, candid and with some great personal examples, it’s a delight to read even for those who shun self-help books. Helen Garner: This House of Grief – Deliberate revenge or tragic accident? Garner examines the court case of Robert Farquharson, who in 2005 drove into a dam with his three children. I expected this to be more of an examination of the background and family life which led to the tragic event described, but it really is a detailed account of the trial (plus appeal and retrial) and the reactions of the author and the people around her to the unfolding of procedures. Interesting, because it shows how subjective the law can be in court, how easily swayed public opinion (or the jury’s opinion). A great companion piece to Little Deaths. Stephen May: Stronger Than Skin – psychological thriller from the man’s perspective, which makes a nice change. I admit that one of the two time frames, the Cambridge setting of the 1990s, played a big part in my decision, although I did not feel truly transposed into that world. A story of obsessive young love and more mature realisation of responsibilities and limitations. I did enjoy the poke at the pretentiousness of middle-class, middle-aged life, in particular through the unconventional character of Lulu, the photographer girlfriend of a former pupil of the main character Mark Chadwick. Goodness, that sounds complicated – I should have started that sentence elsewhere! Terry Pratchett: Snuff – even when I pick something amusing from the library, there is still a crime element involved, as Sam Vimes finds a corpse waiting for him when he goes on holiday in the countryside.